The home of ask dr. robert, a question and answer forum open to everyone worldwide, gratis. Post questions on the Dr. Robert Forum in order to open a discussion among yourself, forum regulars, and dr. robert. To request a personal consultation with Dr. Saltzman, send an e-mail, stating your reason for wanting a meeting along with your times of availability. Time is not separate from substance. They are both versions of the same unknowable, unnamable suchness. "Forget what others say. Forget so-called "nonduality." It's only a word. Just be yourself, and find out what NOW is." An interview with John Lekay of Nonduality Magazine about spiritual awakening, spiritual teaching, and the nature of "nonduality. Awakening Never Ends,a memoir about my work as a psychotherapist and teacher, and some words about what the experience of "awakening" or non-duality is not. A radio interview with Jerry Katz of Nonduality Salon, discussing psychotherapy, nonduality, and spiritual awakening. The Psychology of Awakening: A recorded conversation between Robert K. Hall M.D. and Robert Saltzman PhD. Noticing awareness, and abiding in it requires no effort at all. You do not have to earn it, and you do not have to deserve it. It is here now, always has been, and always will be. Nothing needs to be added to this moment, and nothing can be added to it. But when I tell you this, you doubt it, and so you continue the relentless seeking—which is simply more egoic seeking. Calling it “spiritual seeking” or “practice” changes nothing but the name. Although this very moment is all we ever have, you continue to seek something “better,” something “higher,” something more “evolved,” some accomplishment you will eventually realize by following a supposed path. That fruitless search continues, and will continue until the fantasy of becoming exhausts itself and you find yourself at last, just as you always were. 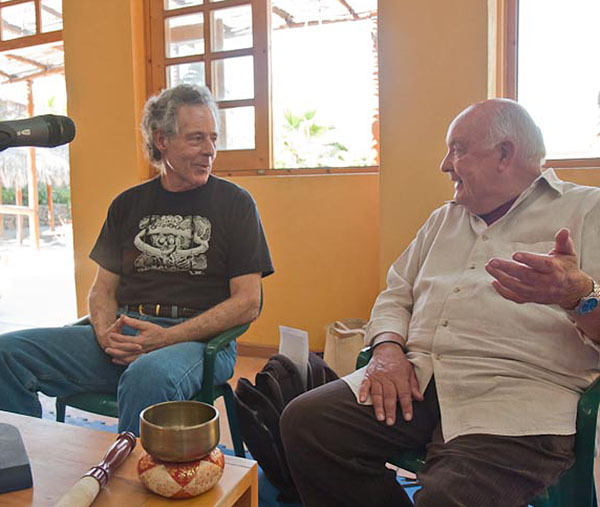 Jerry Katz's Nonduality Street: Questions on the role of a spiritual teacher. A radio interview with, Benjamin Smythe, John Troy and Trip Overholt. In this moment, things are as they are and cannot be any different. Ignorance of this simple and obvious fact is a principal source of psychological suffering. "I've experienced a lot of abuse in my life and so suffered from mental health problems. I think the worst part of my abuse was remembering being molested as a child, and these memories have been resurfacing just in this last year. The biggest problem for me when i first came to acknowledge what happened to me as a child, was at first i had this strong sense and feeling that i was in some way damaged or tainted. But now i come to realize more and more that i am not. Not when you talk about awareness. To me i realize now that the things i went through are not who i am, they were things that happened and now they are only really past events and how i perceive them. And as this perception happens in thoughts and feelings then they really are no part of what i truly am. And this has led me to believe im just as pristine, or new (if that makes sense ?) as the day i was born. This feels very liberating for me. i still experience grief and anger from time to time but im aware there natural thoughts and feelings and they dont take over my life. They arise, i acknowledge them and then let them go. I dont need to be scared of them as there not what the real me is. And its just a part of being human." ---Claire, writing on the Dr. Robert Forum. Recent Threads Of Interest On the "Dr. Robert Forum:"
your words, "how absurdly frightened" the ego is... they hit the mark. Is life pointless? Isn't everything just meaningless? How Can I Let Go Of Fear? Recent pages from "ask dr-robert"
Is awakening the same as forgetting the past? Isn't everything just meaningless? How Does a Doctor Deal With the Terrible Suffering He Sees Every Day? How Can I Awaken From Delusion Into Nonduality? Does the "I" Prior to Ego Have Any Characteristics? How is Nondual Awareness Different From Ego? What Did Joko Beck Say About Awakening to True Nature? Does awakening involve the disappearance of the ego or sense of a separate self? How Does An Awakened Person See The World, and How Can I Jump From Here To There? The Entire Spiritual Dilemma Boils Down To One Problem: Denial. What Is an Awakened State? What Is Non-Duality? How Can I Realize Freedom? I Love My Husband But I Am Not Attracted To Him, and I Fantasize About Other Men. They Say That When You Are Ready a Spiritual Teacher Will Come. Is This True? Can You Identify a Psychopath By the So-called, "Soulless, Psychopathic Stare? Is It "Normal" to Wonder What People Look Like Naked? One common reason for consulting a psychotherapist seems worthy of urgent special mention here. If you suspect that you or someone you care for may be suffering from depression, please read am I depressed?, which deals with brain chemistry and depression, and discusses treatment of depression with medication, psychotherapy, or spiritual understanding as required. Careful attention to diet, as well as daily physical exercise, is good not just for bodily health, but for improved emotional health too. In other words, mood disorders such as anxiety and depression should be not treated with medication and talk therapy alone, but rather with a combination of psychotherapy, medication (if necessary), properly chosen food and drink, daily aerobic exercise, and other healthy choices. Increasing the proportion of beneficial foods in the diet can sometimes make dramatic changes in how one feels both physically and emotionally, and can often reduce the incidence of serious disease. A recent study, published in The Journal of the American Medical Association, suggests that one specific approach to diet, the so-called Mediterranean diet, probably is optimal for many people. If you have not been feeling well, please begin self-treatment by adopting some of my dietary recommendations. If you you have questions or concerns that you have wanted to ask a psychologist--whether about lifestyle changes, about counseling and psychotherapy, about spirituality and spiritual unfoldment, or just about human life in general, please post your questions on the Dr. Robert Forum where they may open a discussion among forum regulars, many of whom bring intelligence, experience, and wisdom to these conversations. I check in on the forum regularly, and will contribute if and when necessary. In addition, you may send an e-mail requesting a personal consultation. Please state your reason for wanting a meeting along with your times of availability. To comment about anything relevent to this website, or to read the comments of others, visit the dr. robert forum, where your comments may be posted for all to see. www.dr-robert.com contains no advertising of any kind, and is edited and supported solely by Dr. Robert Saltzman, Ph.D., Box 75, Todos Santos, Baja California Sur, Mexico, 23305, as a source of information about his counseling practice, and about mental, physical, emotional, and spiritual well-being in general. www.dr-robert.com does not collect information about visitors to this web site for any reason whatsoever. If you elect to share your email address by sending a comment or a question for "ask dr-robert," your email address is never given to any other organization or individual. If you submit a question to "ask dr-robert," or on the Dr. Robert Forum. you agree that your question, along with Dr. Saltzman's reply, may be published on the website or elsewhere. All writing and some images on this website are the intellectual property of Dr. Robert Saltzman, subject to copyright protection. Any use of these materials without prior written permission is expressly forbidden. TODOS SANTOS psychology TODOS SANTOS doctor robert saltzman. ask the psychologist. Entire contents of this website copyright © 2004, 2005, 2006, 2007, 2008, 2009, 2010, 2011 TODOS SANTOS Counseling Therapy Psychotherapy ask psychologist dr robert saltzman. psychology todos santos counseling todos spiritual awakening non-duality spiritual teaching santos psychotherapy todos santos therapy todo santos. psychology todos santos, cabo san lucas counseling cabo san lucas, therapy cabo san lucas psychotherapy cabo san lucas. psychology baja california counseling TODOS SANTOS baja california todo santos therapy baja california psychotherapy baja california. ask the psychologist dr-robert TODOS SANTOS. psychotherapist todos santos doctor robert saltzman, ph.d. ask a psychologist todos santos cabo san lucas baja california mexico. all rights reserved. doctor robert saltzman, TODOS SANTOS, baja california, mexico.